An interview with Ralph Rowe, Senior Research Assistant at the Canadian Museum of Nature, conducted by Stuart Milne, BA. Please give an overview of your work at the Canadian Museum of Nature. I'm a Senior Research Assistant at the museum and my main interest is the discovery and description of new mineral species. Our research can be geology, mineralogy and crystallography oriented. I'm in charge of the X-ray diffraction lab and use the D8 DISCOVER with EIGER2 R 500K as my main tool for investigating and describing new species. I also use the unit to do mineral identifications for our collections for proper labeling or as part of the acquisition process. What type of mineralogical specimens do you study? Often new mineral research is done in cavities (vugs) in igneous rocks created by bubbles in the magma where exotic, incompatible elements and fluids are concentrated during cooling. This exotic chemistry allows for the crystallization of new and unusual mineral species often occurring as a single find of a few micro-crystals. Limited destructive analysis as offered by this type of micro-diffraction is important to preserving as much material for other analyses and for the type specimen going into our collection. Why is XRD the preferred technique for the work you do? XRD is in fact one of many steps in our research, but the micro-diffraction aspect of it is of utmost importance due to the analytical speed when simply investigating the mineralogy. How has X-ray diffraction helped you in your work? My work is X-ray diffraction, it's the tool that I use to contribute to and collaborate on projects. It helps with the identification of unknowns (or lack of identification when compared to the database). Because of its quick analytical time and easy sample preparation, X-ray microdiffraction is often used as our first investigative tool for new species or species of interest for our various projects. 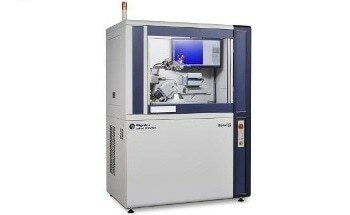 XRD is important in determining the materials structure and refining unit cell values for publication. What challenges do you face when studying large rock specimens with small embedded single crystals? I do most of my work and sampling under a microscope and I take pride in being able to sample the tiniest of crystals. The main challenge is not to lose the crystal, especially when working with high value material such as rare new species. Those tiny crystals can easily fly off and be lost forever if someone is not careful. Over the last 16 years, I've come up with many tricks to limit this possibility allowing safe transfer to a frosted slide and for turning the crystal into smaller fragments for creating a powder mount. How does the D8 DISCOVER from Bruker help you overcome these challenges? I would say that the main advantage that the current unit has for small crystals such as the ones I do research on, is the ability of the stage to rock along the Psi axis while completing quick Phi axis rotation. This allows for increased random orientations, which is key to obtaining nicer Debye-Scherrer rings from coarser material. With rare material, we don't have the luxury of grinding crystals down to a perfect powder. To guarantee enough diffraction, we must often resort to mounting of coarser fragments instead. Accurate alignment of the tool and of the sample to the center of the tool is also extremely important. 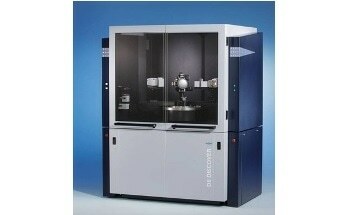 What flexibility does the D8 DISCOVER from Bruker offer you? Another feature of the D8 DISCOVER that is greatly beneficial is the tweakable calibration. It’s also compatible with a calibration method that I published in 2009 for an older unit which it allows for a quantification and an assessment of the experimental error, reflected in the cell-refinement results and comparison with structural data. How quickly are you able to gain the data you need? In X-ray diffraction the nature of the mineral is as important as the technique itself, but a well-diffracting mineral can be identified easily in 1 or 2 minutes, even less if we wanted and this is using a 200-micron sample, which is very small. For more investigative research 3 to 5 minutes per frame to get more detail. When it comes to publishable data, I program a multiple frame run to go all night to maximize the contrast of low intensity peaks to background. How has XRD helped improve cell refinement for new mineral species? 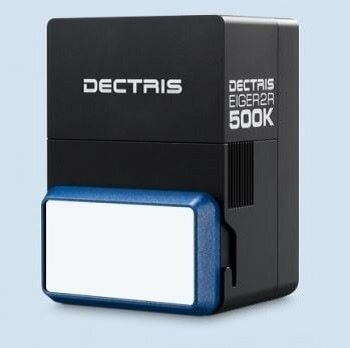 The new equipment, with the Dectris high-resolution EIGER2 detector, gives data that allows for accurate cell-refinement of minerals all the way down to the triclinic system, especially when using TOPAS software rather than peak indexing. In fact, with the pin-mount method and this equipment, I have concluded that the size of the powder mount is now the limiting factor for resolution and not the equipment as it was in the past. Where can our readers learn more about your work? 30+ articles as first and co-author on new species, calibration technique, structural data, diffraction data and geology, in The Canadian Mineralogist, American Mineralogist, Mineralogical Magazine and Powder Diffraction Journal amongst others. My first new species described was qaqarssukite-(Ce) from Qaqarssuk, Greenland. Other new species include nisnite, bussyite-Ce, bussyite-Y, arisite-Ce, arisite-La, hydroterskite, veblenite, putnisite, eldragonite, garronite-Na, hydroxylgugiaite, omongwaite, ferrivauxite and ferrochiavennite with contribution of XRD data for kampfite, johnsenite-(Ce) and alflarsenite. Keep an eye open for more new species currently being described. Born and raised in St-Arthur, in rural New-Brunswick, Ralph Rowe left his native province to study Geology at the University of Ottawa. There, he obtained his B.Sc in Geology (2003) and followed by a COOP student position at the Geological Survey of Canada, acquired valuable experience on a Bruker powder diffractometer. This newly acquired experience played a big role when he joined the Canadian Museum of Nature to operate a Bruker series-1 D8 DISCOVER micro-diffractometer with a Hi-Star detector. After more than 15 years, close to twenty new species and many publications later, the lab upgraded to a Bruker D8 DISCOVER with a EIGER2 R 500K detector, which will lead to more discoveries and interesting research. At the museum, he discovered a passion for mineralogy and the research of exotic micro-minerals from alkaline rocks, often leading to new mineral discoveries. A fun day at work would be cracking open cavities in rocks of interest and then, surveying the mineralogy of those cavities under a microscope for unknowns to analyze. His other work-related obsession is to obtain the best quality data from his XRD units for the large variety of research projects that end up going through the lab.